How to append a long text with trimming(...) character in a GridGroupingControl? 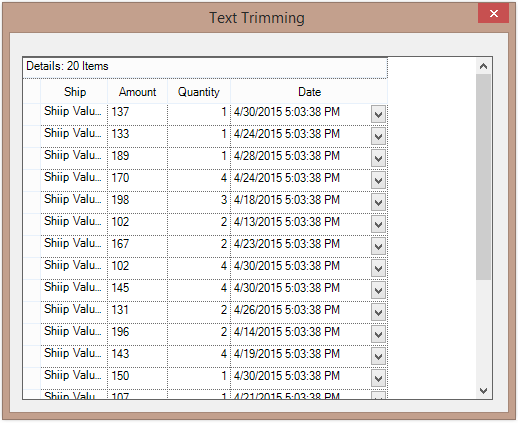 In GridGroupingControl, when you display the long text in a cell, the exceeding text is hidden in that cell. To display a long text with trimming (...) character in GridGroupingControl, it can be achieved by setting the Trimming property as EllipsisCharacter. In the above image, ship column text has been trimmed. Note: Before setting the Trimming property, you have to confirm that WrapText is set as False.